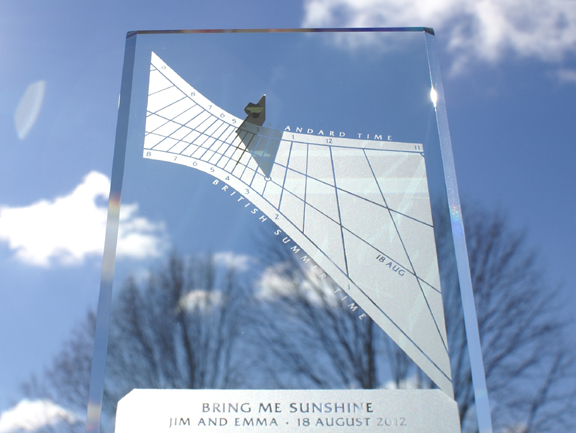 One of the reasons why the Spectra sundial is such a perfect personalized anniversary gift is because it can be very uniquely customized to celebrate a special occasion. A personalized inscription can be added at no extra charge with extra lines of text, and date lines can be added to commemorate special occasions such as birthdays, weddings or anniversaries - then the the tip of the time shadow will follow the corresponding date line each year during the course of the special day. Scroll down this page to see some specific examples, and click on the pictures if you'd like a closer view. You can find more detailed information about the Spectra sundial on the Spectra details page, and you can see more pictures of the Spectra sundial in context and the brilliant colors it can make in the home on the Spectra gallery page. 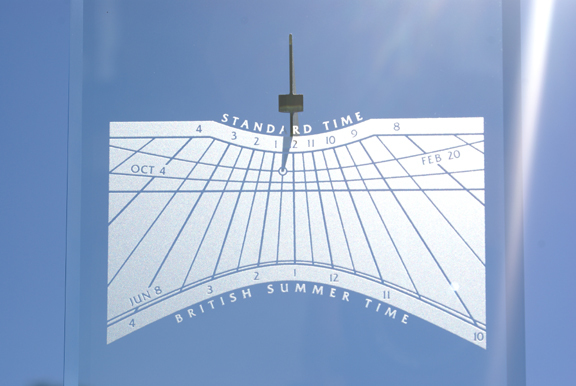 In addition to special personalized inscriptions, birthday or anniversary date lines and "moment marks" can be added to create a Spectra sundial that is a truly unique one-of-a-kind birthday, anniversary or wedding gift - a custom timepiece that will do something interesting on each of the special anniversary dates each year. The sundial layout above is from a south facing Spectra that has several date lines...there is a date line for the couple's wedding anniversary, as well as date lines for their birthdays. The couple was married on February 20th at 12:30 pm, so we added a special moment mark on their personalized anniversary date line to celebrate the actual moment in time that they were married every year on that day! See how the tip of the time shadow is touching the special mark? 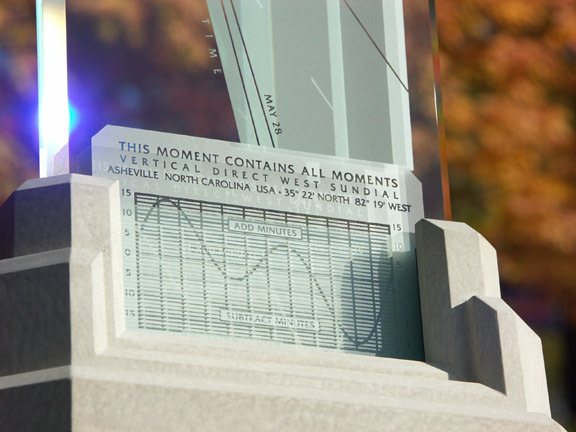 The Spectra sundial pictured above was designed to face a southwest direction, and the couple was married on August 18th at 2:30 pm. 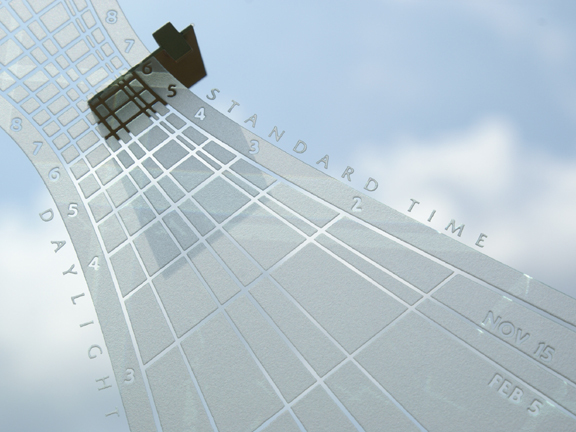 Notice that the tip of the time shadow is touching the special moment mark on their personalized anniversary date line at the actual time that they were married. 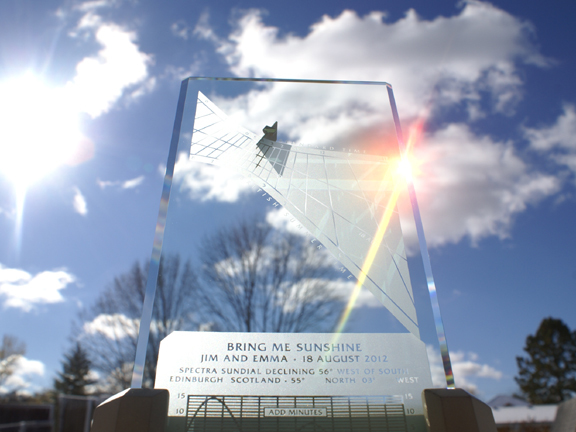 As long as the sundial is designed to face a direction where it will be receiving direct sunshine at the time of the wedding ceremony, we can add a moment mark to the personalized anniversary date line that will celebrate the special moment in time on their anniversary day each and every year! You will be given the opportunity to request personalized inscriptions and birthday or anniversary date lines near the end of the ordering process. Not all dates, or combinations of dates, are suitable for inclusion if they happen to be very close together or very near to the solstice or equinox lines. Check with us directly if your desired birthday or anniversary date is close to any of these days...we may have some tricks up our sleeve to make it happen for you anyway. Contact us directly with any special ideas for personalizing your Spectra sundial, and we will try our best to make you one of the most splendid unique personalized anniversary gifts that you will ever find!